The word 'Gurmukhi' literally means from the mouth of the Guru. 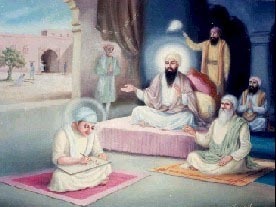 It was developed in the 16th century CE by the second Sikh guru, Guru Angad Dev Ji, to write the Punjabi language. Gurmukhi has 41 alphabets/varanmala (35 basic + 5 Urdu + 1 Talvi) as well as ten vowel modifiers. In addition there are five special sound modifier symbols. A vertical bar is used to indicate the end of a sentences. Two vertical bars indicate a longer pause between sentences or paragraphs. To view the next pages, you must have "AmrLipi" font installed.